The incline bench press is an exercise that targets the pectoral muscles of your chest. However, this exercise can be problematic for individuals that have impingement or other conditions that decrease the subacromial space of your shoulder joint, according to a review conducted by sports specialist Carly Green, appearing in the October 2007 "Strength and Conditioning Journal." A condition which limits your subacromial space is further compounded when performing the incline bench press. Your subacromial space is the area of your upper arm where your humerus connects into the shoulder joint. The incline bench press restricts the movement of your shoulder blades and the location of the weight forces your humerus down into your shoulder joint. This further decreases the space in the subacromial area which causes your tendons and ligaments to get pinched and feel pain. The incline bench press requires an adjustable bench or a pre-built incline bench. The typical angle of the incline is 45 degrees but can be 15 degrees higher or lower. Lie with your back against the back support of the incline bench with your bottom against the seat. Your feet should be flat on the floor. Grab the bar with an overhand grip with your hands spaced shoulder-width apart. Lift the bar off the rack and lower it so that it touches the center of your chest. Lift the bar off your chest by contracting your chest muscles until your arms are fully extended. The exercise can also be performed with dumbbells. 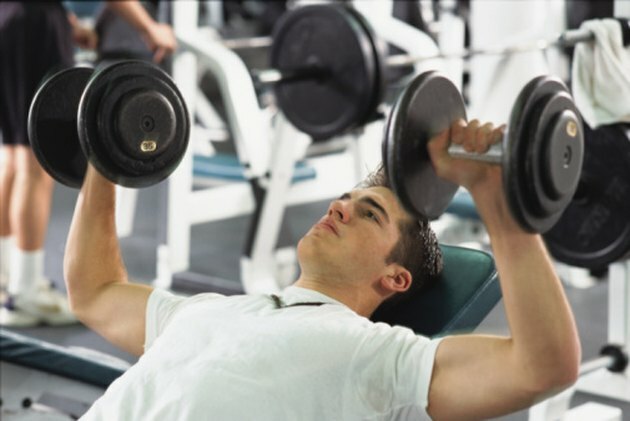 If using dumbbells, the dumbbells are lowered until they touch the sides of the chest. There are two direct modifications you can make to the incline bench press to reduce the strain on your shoulder joint. The first modification is to lower the bar until you reach a 90 degree angle at your elbows. This means the bar will be at approximately chin level. However, sacrificing depth will prevent full utilization of your chest muscles. Another modification is using a narrower grip with your hands located 6 inches inside shoulder-width apart. This will place more focus on utilization of your triceps muscles but will allow you to get the standard depth on the lift. The decrease in space at the shoulder joint is reduced because your elbows have more room to bend so that your shoulders do not have to compensate. If the modifications still prove to be too painful or you don't want any risk associated from the incline bench, there are two potential alternative exercises. A decline pushup, where you perform pushups with your feet located on a bench or chair, closely mimics the incline bench press movement. However, your shoulder blades are not trapped against a seat and can move more freely to allow for more room in the shoulder joint so that muscles can move properly. The other exercise you can perform is a standing angled cable pushout. This exercise requires a cable tower as you push two hand attachments away from your body at a 45 degree angle relative to your chest. Again, the free movement of your scapula, shoulder and elbow joints will greatly reduce the strain on your shoulder that is associated with the angled movement of an incline bench press. Talk with your doctor and physical therapist if your shoulder is bothering you when performing incline bench presses. A proper diagnosis along with consultation will allow you to choose exercises safe for you to perform. If your goal is general fitness, you can avoid the incline bench altogether. However, if you play a sport that requires a movement similar to the incline bench press, then the modifications and alternatives can be used.